Let’s talk a little about client discovery and dns requirements. The records will be described bellow and we will bring a little brief about it. We can start with SRV records. The service record (SRV) is a record that defines the location for specified services. To create this record, you will need a service name, protocol desired, port and target. Example: _servicename._protocol.<domain name> pointing to an target. Also, in this record, you need to include the port, priority and weight. So, what is the SRV needed to Skype/Lync do the sing in? The internal sign in process, you will need the record _sipinternaltls._tcp.<domain name>. This is for internal TLS connections. Also, if you need non-encripted (for TCP connections) sign in process you can create _sipinternal._tcp.<domain name>. To external connections, the client will search for record _sip._tls.<domain name> to do the registration process. _sipinternaltls._tcp.adatum.com. @ SRV 0 0 5061 poolint.ucsteps.com. For TLS connections, you will use the port 5061. The autodiscover process looking for two records, internally for lyncdiscoverinternal (directly to internal web services) and lyncdiscover for external web services(you will need a reverse proxy to do it). 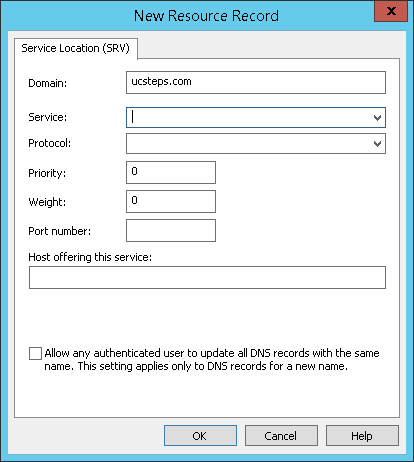 So, the records will be host A.
lyncdiscover.<domain name> A <external Reverse proxy IP>. Now, we need to create the sip records. The sip records, have three kind of records(I think could be 4). Also, you will need to create the records of(depending of the scenario): meeting, dial in, admin, webconf, av, federation, office web apps, Front-end and the pool names to complete all the requirements. If you will use Edge Server, remember in to check the ports in the topology.